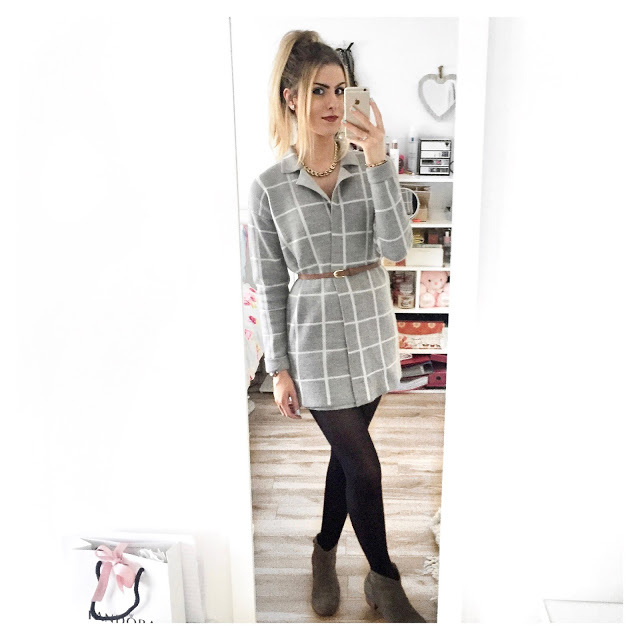 A pretty much all-grey outfit is something I'd never tried before.. but adding statement jewellery, a bold lip and some white heeled boots where what made this outfit that bit more comfortable for me. The jeans that I'm wearing in the image above were actually purchased from Topshop a few years back.. I have the same pair in blue/cream and I'm sure Topshop brought them out in a burgundy shade too. I remember these were super popular at the time because Zoe (Zoella) posted an image of her wearing the blue/cream ones, and all colours pretty much sold out immediately and have never re-appeared, so unfortunately they are unavailable. The grey ribbed top however, is also from Topshop and is still available! I'm seeing high neck tops everywhere this season and I love their simplicity, yet you can definitely 'dress it up' with a statement piece of jewellery or a printed coat. Lastly, the little white boots were probably the best find of all time.. they were on sale for £10 in New Look shortly after Christmas. What a bargain. Speaking of bargains, I purchased this grey checkered cardigan/jacket (also from New Look) last year. There had been a Topshop coat I'd been eyeing up for months but I couldn't justify spending £90 (I think that was the price) for a piece that may have completely gone out of style very quickly. I tend to invest money in pieces that I know I will get a lot of wear out of, and that will still be in style for years to come.. so when I saw this much cheaper alternative in New Look (pretty sure it was around £20), it had to be mine. Even if I hadn't got much wear out of it, I definitely didn't break the bank with this one. Even better, this cardigan can double up as a dress when closed, and I decided to add a skinny brown belt to cinch it at the waist. Have a look through some of my favourite pieces to re-create this look. For the products which are unavailable, I've linked some similar items below.